Tandora was founded shortly after the transition to the 'Magic Era' and first began as a stronghold for humans as they struggled to keep their foothold in the world. The very first building in Tandora was a rundown and abandoned castle fortress which they utilized to become their greatest defense against invaders. Men and women alike worked endlessly to repair and reinforce the fortress's walls, as well as setting up the inside of the castle to be more inhabitable. They succeeded due in part to their growing population, and also for their ingenuity for siege weapons used both to defend and to conquer nearby land for resources. Over time, villages began to expand around the fortress and the walls were extended to protect the people and their homes. Word of their success spread across the lands and slowly people from other races that were masters of their trade sought work in the human's great city. Though they were hesitant, they lacked craftsmen in many fields of work and ultimately had trust enough to accept. Ultimately a wise decision. As more master craftsmen came and apprentices trained, Tandora expanded and became a great city recognized for its power by the people. Soon a central government was settled within the castle, and everyone not wishing to join with the royal family chosen to rule, left to start their own establishments in the city. Now deemed the capital of the world, Tandora has become the center of trade and the middle of all trade routes. People from all over the world would now have the opportunity to visit the capital and possibly stake their own claim within its walls. Not everything about the capital is glorious in the current day as most would tell you. The population growth expanded much faster than the architectural growth, making streets crowded and housing difficult to come by. The noise level in the streets is enough to drown out a singular voice near the more popular areas like the market, and the roads are covered in filth that rarely has the opportunity to be washed away. Crime in the capital is higher than other cities despite having a large number of guards and knights because with more people comes more chance for poverty; with more poverty comes more desperation; and desperation leads to crimes as people strive for survival. As a city, farming was a trade that became nearly non-existent and merchants traveled from other areas to bring their food into the city to sell. Families living in Tandora that lost their farming land suddenly had no way to get food to their homes and had no means for education in another trade. The main road of travel in the city connects the middle class area in the north, the lower class area of the south, and ends at the mountain/forest entrance to the east. The upper class area of the west have private roads that reach and connect to the main road, but they are heavily protected and guarded so that they are rarely used by travelers. 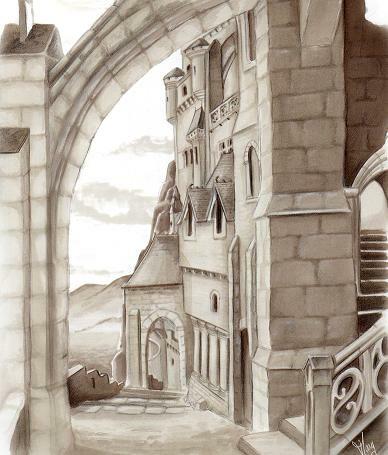 A wall surrounds Tandora around the city except in the south, where guard towers are in place for large invasions, but protection from beasts or individuals are not in place and the poor are the first to take the hit. This gives warning to the rest of the city in time to protect themselves and get the royal guard in place, but the lower class become innocent victims. As a large city, Tandora now has sections of varying statuses. The center of Tandora is where the castle is located, and around it is the main market area where most businesses have their buildings or carts. When the city holds events they are often held here. It is not a far walk if one enters from the north or the forest in the east, to get to the central area; but if entering from the south the walk is both long and dangerous as one passes through the areas of poverty. The center of the city is where most of the noise and filth covered roads are found due to the high amount of travel. Yet it is also where most people wish to visit if they want to find goods, work, entertainment or rest. Few areas in the rest of the city have businesses worth checking, especially if you wish to keep your coin purse or head in tact. The poor conjugate into the southern areas where the water washes the waste from the center area of the city down into their areas, creating disease and increasing the rodent population. No one with a choice picks to live in these areas which have the most crowding and filthiest air. Pollution killed off the nature within and around this section of Tandora, so no foliage or animals reside and make the residents travel by foot an hour to get to the center area of the city just to work, get clean water, or buy their goods. The west is not accessible from outside the city as the rich have invested their own money to make sure the walls around their section of the city are extra high and reinforced. Except for the occasional private access gate to a person's own property, no official entrances can be found in the west. Perhaps the best location in Tandora, the roads here are not dirt like everywhere else but are covered in stones which help reduce the wear of foot traffic and carriage wheels. 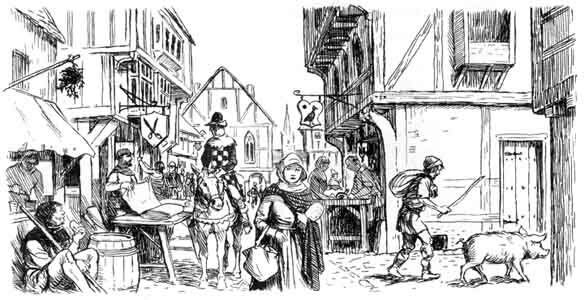 An occasional shop will be found here, such as silk clothes or fashionable accessories, but often the price of the goods far exceeds the spendable wages of anyone outside the upper class. The nobles who live in this area are very protective of their property, and rumors of people kidnapped for slavery or killed for being too 'suspicious' are heard around Tandora. Not many choose to take leisurely strolls through the west, despite the beautiful scenery and houses. The north blends a lot with the center of the city because this is where the working class build their homes. The middle class build their homes in a way that best suits their trades, so sometimes when in the north it is easy to mistake it for the central area. Toward the east side of the northern area is where you will find farmers, since they are close to the Blue Orb forest and can utilize the greenery and wood to their advantage. Most people that visit the center of Tandora live in the north. Copyright © 2014, Mystic Worlds RPG/Varlonan RPG by Jessimi G., All Rights Reserved.